Let me start of by saying, thank you to my wonderful husband for giving this to me as a surprise. I was really sick a few days ago and had to stay at home. Hubby and I were supposed to go out to lunch together but I was feeling nauseous and dizzy, so he had to go out alone. I've been wanting to get this lipstick ever since MAC Cosmetics opened here in Cebu. It's a very unique shade and I couldn't find any dupe from other brands. 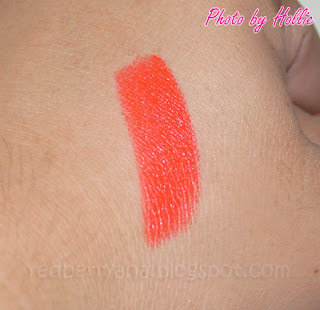 I just think it's the prettiest bright neon orange lipstick I've ever laid my eyes on. I find the price of Php 1,000 for 1 lipstick to be very expensive, but I just really love this color so decided to go get it. However, every time I go to MAC this shade is always out of stock. Early this March I saw Morange again in their lipstick rack but the problem is that I didn't have extra cash at that time. So, I ended up not buying it. I just love how creamy and pigmented this lipstick is. The scent is awesome, it's very mild and the smell reminds of caramel. It has a decent staying power. Stays on my lips until the next meal. 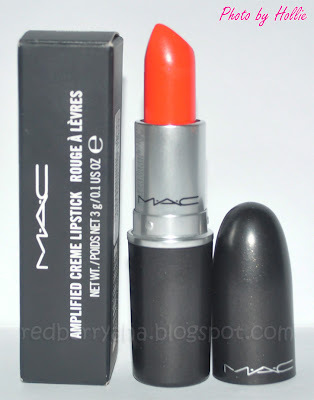 So, I'm quite satisfied with my very first MAC lipstick. Yay to awesome hubby's!!! The color is beautiful on you. What a great way to burst your MAC bubble! Does have something like the L'Oreal Infallible? WOw! This is very beautiful! It looks lovely on you! Perfect for 2012! omgosh that color is SO gorgeous!!! so perfect for this spring and summer with the pop orange color.. and how sweet and thoughtful is your hubby :)! Your hubby is awesome!!! That is one hot color. LOve, love, love it!